This time my assignment was Erin of Dinners, Dishes, and Desserts. Erin went to school for finance, but chose to stay home after son was born. As the name of her blog suggests, she is up for trying to cook anything, from dessert to snacks to drinks to main dishes. She has living in the midwest (that’s where I am) but now hails from Colorado, the lucky duck! There are so many yummy things to chose from on her recipe index, including a HUGE list of muffins and breakfast items (you know I like that!) And desserts! Oh yeah, she had quite a few of those. 🙂 Mmmm-mmm…. Nutella Magi Shell, Cupcakes for Two, Caramel Layer Bars, Margarita Cake, Molten Lava Cake. So what to choose? We we settled on a nifty recipe for making and individual recipe to make Blueberry Coffee Cake in a Mug, though I made ours gluten and dairy free. 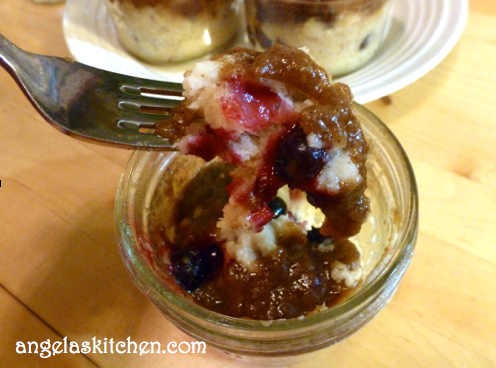 My kids and I liked that we could prep the mini coffee cakes the night before by putting the wet ingredients in the mug or canning jar (I have a ton of them around the house, so that is what I used), and having one small cup with the dry ingredients and one with the mix-in. Having everything prepped made it even easier to make and individual coffee cakes in the morning for the kiddos. They each pick their favorite mix-in, which makes it extra fun, I think. Your favorite flavor and you don’t have to share. Bwahaha! Thanks, Erin, for the fun recipe. I can’t wait to experiment with more flavor combinations. For an easy-peasy gluten free flour blend I mixed up 3 cups rice flour, 1 cup potato starch, ½ cups tapioca flour and 1 tablespoon xanthum gum. In a microwave safe coffee mug, cup or jar soften ½ tablespoon of margarine in microwave for 5 seconds. Then stir in the sugar and brown rice syrup, mixing well. Add in the applesauce, vanilla, gluten free flour blend, baking powder, and salt, stirring until just combined. Add in your favorite mix-in and fold into the batter. Smooth top of batter a bit. In a separate bowl, combine all streusel ingredients with your fingers or a fork, working the margarine into a sandy texture. Sprinkle topping over cake batter in cup. Cook cake in the microwave for 75 seconds. You don’t want to over cook the cake, but you want the top to be just set. Get your spoon ready and go to town! Thanks for the kind words! Glad that you liked the coffee cake, it is a good one! I've made similar recipes in a mug, but I LOVE the jar idea!! 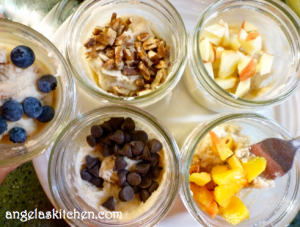 Oh my gosh, I love that you prepped things the night before so that you could make a quick yest delicious breakfast in the morning! Great idea! 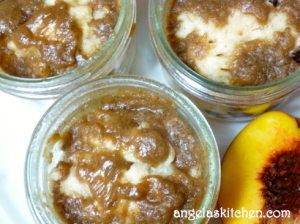 And these look great, especially in the canning jars (vs. a mug). Love it! What an excellent idea to prep it all the night before and have a build-your-own coffee cake bar in the morning . Very nice.